← Red, white and blue … and YOU, the grillin’ gourmand. Diary of a Mad Gardener. Those who follow my blog regularly know that my favorite trek is the one to Council Point Park where, for a brief time, I can walk the perimeter path and commune with nature at the same time. Whether it is just an inquisitive squirrel or a sparrow streaking by, I always leave with a sense of peace after being infused with the natural surroundings. This past week I have been absent from this forum as I have been communing with nature all right – out in the front and back yards doing the annual “getting the yard presentable ritual”, a chore that seems to take longer to pull off as each year passes. Unfortunately, it was longer and more protracted this year, since I had to buy 30 bags of mulch and lay it. Now, I realize that the perimeter of the house or the front and back yards have not gotten larger, but instead, it is me, who sadly has gotten older. It seems the spirit was willing – the body … not so much. Summoning the energy to get ‘er done seemed more and more difficult to do as each day passed. Looking around the yard, it seemed inconceivable to me that I created the present landscaping from scratch back in 1985, lugging home many 8 foot by 4 inch landscape ties, bags upon bags of dirt and mulch and small shrubbery in my AMC Pacer. I wrecked the springs on the car that Summer, but I remember that it seemed like I had endless energy to do the massive landscaping project which took me that entire season to complete. Since my boss left for the cottage in Canada last Wednesday mid-day, I set my sights on going out from 7:30 a.m. to 1:00 p.m. every day ‘til I had whipped the yards and gardens into shape again. No walks. 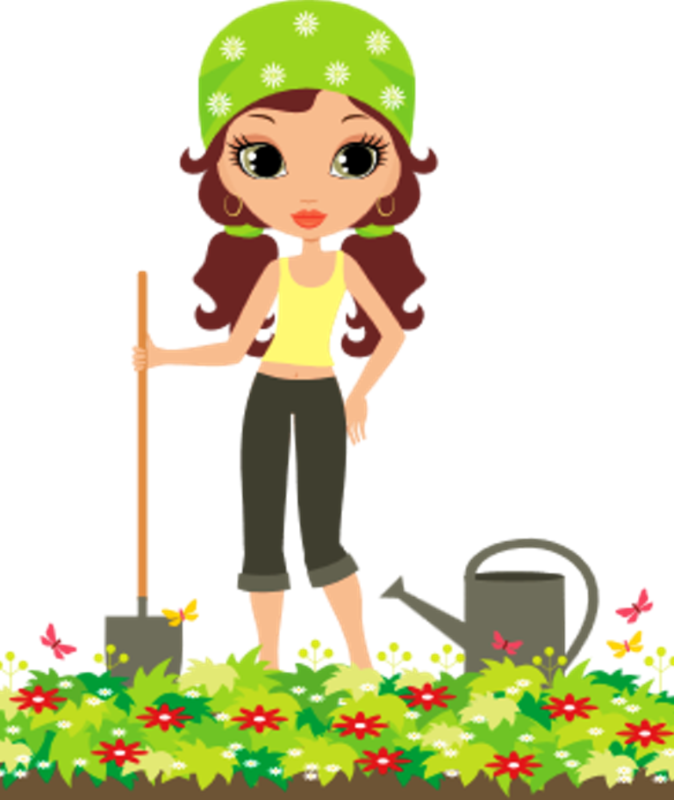 No fun stuff … just getting down and dirty in the yard with my garden tools. Little did I know that besides whipping the garden into shape, I would find many long-underused muscles that would also get used and abused over the course of the next five days. And to think I had been complaining about the two thorns deeply embedded in my finger from the weekend before when I stooped to pull out those aggravating forget-me-nots and hastily raked my ring finger over a rose bush thorn. It sure hurt and involved “minor surgery” with a safety pin to extricate those little buggers so I could type. “T” is for “Thursday” and also for “tenacity” … no, not me, but my holly bush. I was up at the crack of dawn and dressed warmly to go outside in temps that flirted with the 50s … the low 50s that is. But 50 was not so nifty when a glance at the calendar tells me a mere month from today is Summer. I hustled out and just stood, gazing at the panorama, really and truly unsure where to start first. Everything looked overgrown, neglected … and unloved. Plus, we’d had a light drizzle on Wednesday night. I grabbed my tools – hand pruners and loppers and decided to tackle taking down the holly first. It died during the Winter of 2013-2014, from one of the Polar Vortex events, because last Spring it was as dead as a doornail. I heaped “Holly-Tone” aplenty on this huge bush last year in an effort to revive it, but sadly it was all sticks and twigs with no greenery. But today, while I wiggled my pruners through the dead branches, suddenly I saw the light – or perhaps I should say the green, because there were many fresh, green holly leaves and supple branches at the very bottom of the bush. “T” is for tenacity that this big holly bush should live after all and again grace this garden. There are enough new shoots after using my saw to lop off the large, thickish branches to start anew. “T” is for trimming – I trimmed everything out the front and kept running down to the curb to ensure I didn’t over-trim, kind of like my parents did when they were in charge of my bangs back in the day. “F” is for “Friday”, for “feeling less than frisky” and for those “fluttering and flying” elm and maple seeds. I woke to the alarm feeling like someone took a steamroller across my entire body. Feet planted firmly next to the bed, I started to stand up – oops. Clearly my feet didn’t want to support my legs that felt jelly-like. I pushed myself off the bed with arms that also felt wobbly, but managed to shuffle down the hall to the kitchen with as much enthusiasm as the commercial of the guy going to make the donuts at Dunkin’ Donuts. I was out the door by 7:30 a.m. The trimming out front was done, so next on the chore list was fixing the landscape edging … good thing it was still nippy out as I was working up a sweat. This task must be done each Spring as the cold air makes the edging heave out of the ground. Sigh. Taking my trusty spade I had to make new tunnels up along the side of the house. It was good that the bottoms of feet, which were clad in short boots, were the only thing on my body that didn’t hurt since I had to keep stomping down on the spade to widen the tunnel. I heard a car start up, glanced over and saw my neighbor Marge backing out of the driveway and raised my arm to wave. Uh oh – I needed to support my arm with the other one to raise it up, so it was a half-hearted attempt at a wave – she smiled and she understood. She’s been there too. The wind was gusting mightily by now and after I completed the arduous task of laying the mulch in between all the shrubs in the front, same which required some artful calisthenics on my part, I watched the paper-thin elm seeds and maple helicopters that were fluttering and flying around in some kind of frenzy settling down all over the freshly-laid mulch. Just great … we have a week of rain and high humidity coming up – those little suckers will be weeds in about two weeks’ time. Once in, hydrated, cleaned up and feeling human again, I sank into my chair and turned on the computer. Ahhhh – bliss. When I stood up two hours later, I nearly collapsed from shaky legs. Can you say “un-limber”? I revisited my computer later that evening, thinking I’d write a blog post detailing my unexciting, but labor-intensive day, but soon my fingers skittered all over the keys and I nodded off – that is, until a big kaboom of a firecracker close by startled me and woke me up. “S” is for “Saturday” and “S” also stands for “stiff”, “sore” and “sunburned” – on my nose anyway. Today was a solid morn that stretched into early afternoon of trimming, nipping, pruning, then scooping stuff into yard waste bags … and oh, the weeds. I was embarrassed by them being that big so early in the season. I thought I’d worked out all those kinks by Day #2, yet I still felt like I went a half-dozen rounds with Floyd Mayweather and he won. My shoulders were so sore, that the blouse with the light shoulder pads I was wearing in the house hurt them. Oh my goodness what a wuss I am. And what the heck is aggravating me outdoors (besides all the work to be done)? This is the third day in a row I’ve come inside sneezing and coughing up a storm. Spring allergies I guess, but I hope it is some aggravation other than the mulch because it is staying put! “S” is for “Sunday” and also for “sixteen” more bags of mulch to lay. At 7:30 a.m. I came trudging out of the house (with as much energy as I could muster) and was ready to lay the mulch all around the backyard which I had trimmed to perfection yesterday with pruners, hedge clippers and my pole cutter. In the cool air I started out by picking up the first group of those 2-cubic mulch bags and hauling them to their final destination and slitting open the respective tops. But some of the bags were filled with wet mulch, so soon I was dragging the bags to haul ‘em along to the other side of the yard, occasionally losing the bag right out of my grip. I think I was losing my grip as well. Grrrrrrr. I had a wide area to fill where the former shed had been and taken a tumble in a bad windstorm last November. So I now can see the yard behind for the first time since the mid-60s … well, look at that, a black and white pit bull giving me the stink eye. Yikes! “S” is the first letter of the word “shovel” which I was using to move the mulch over to the area where the shed stood all those decades. Suddenly, either it was my disheveled appearance or my big shovel, that critter’s ears laid straight back, and he bared his teeth at me in an angry snarl. He lunged at the fence and began non-stop barking. “Nice doggy” I muttered to him, but believe me, he was not a nice doggy at all. I quickly backed off to the other side of the yard – yup, your bark is not worse than your bite and I’d rather not end up as a statistic on the evening news. M” is for “Monday” and “Memorial Day”. I didn’t make my usual trip to Memorial Park to pay tribute and say a prayer for our City’s war dead, deciding instead to head out and finish up this five-day outdoors extravaganza by putting my yard ornaments, pots, planters and flowers out in the yard. I backed the car out of the garage, took out my miscellaneous and sundry stuff and laid it all out when it started to drizzle. Well hell’s bells – everything was all over the place so I worked in the rain. When I FINALLY finished up and came into the house, later in the evening I turned on the computer to weave my tale about working in the yard the past few days. Much to my chagrin, I nodded off right at the computer. I wonder if I was snoring? I looked around – Buddy was watching me, and he burst into song. I’ll bet he was snickering at me as well. Don’t laugh young’un – you’ll be old one day too. I got up and walked around the kitchen a bit, visited with Buddy, had a snack and sat down again, but I was a goner a few minutes later. So, I deferred this story about a mad gardener’s shenanigans ‘til I was wide awake and knew this post would be suited to a “T” (that would be for “Tuesday” of course). 4 Responses to Diary of a Mad Gardener. I enjoyed your work week………………..you make it all seem like so real………hey how about a picture of this finished yard? Ann Marie – I have to take some pictures before I forget how to use the camera … it’s been 3 weeks after all. I will send them to you after I take them. I went outside this morning and there are so many elm seeds everywhere that it looks kind of dirty-looking out there. And the robins were back and had made a nest in the front – mud and grass were everywhere! Although I like the wild birds, robins get on my nerves! It was along 5 days for you. Linda your yard looks great. It is a total transformation. It makes are yards look better too. Marge – yes it was a long five days. I came in and by the time I got cleaned up, and sitting down, it was not too much longer that I was nodding off. I thought to myself “well, at least it looks nice out there after looking so raggedy” … the only thing I didn’t get to was the garage door which the robins are using for target practice. Yesterday morning when I went out there was mud and dried grass all over the place – on the mailbox lid, on the siding, all down the front door glass and white door. I was mad and whacked the beginnings of a nest down and swept it up. When I came back from my walk, they had started another one. Whacked it down. This morning had to do the same thing twice and when I went to the front door to get the mail 1 hours after pulling down the nest there was wet mud dripping from mailbox – I took a bag and some of the store paper ads and wadded it up there … so now the coach light looks bad and there are elm seeds everywhere, the bushes are sprouting and it is starting to look unkempt again. Very disheartening.